If you are looking for easy vegan recipes try this great 7 layer salad recipe, using a mix of any vegetables you prefer. 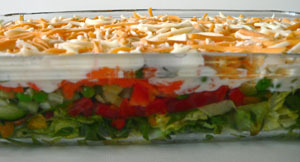 I am going to a neighborhood dinner club pot luck and am bringing this wonderful Seven Layer Salad. Being new to the club I am purposely leaving out any meat in case there are vegetarians in the group. Otherwise I would add bits of real bacon fried crisp and sprinkled on top of the cheese. Mix the mayonnaise and sugar and set aside. Assemble the salad using a glass bowl or glass 13x9 dish. Layer the greens, peppers, celery, onion, carrots, peas. Spread the mayonnaise dressing over as even as possible. Top with shredded cheese. If you want to add meat at this point add 6 slices of crisp fried bacon, crumbled into pieces or a cup of cubed ham on top of cheese layer. This would make it an eight layer salad but then who's counting.